Feasting, frolicking tui swooping from kowhai and cherry blossom, low flying kereru bashing around in your puriri, yep, it’s springtime. Cheery companions when gardening, or out walking, these feathered spring visitors encourage a ‘feel-good’ optimism, and banish lingering remnants of our winter gloom. If you’re designing a new garden, or redeveloping an old, try to craeate a setting where your avian friends will also be at home – it may double the pleasure you get from the garden. To encourage birds into your garden supply food, water for drinking and bathing, and areas of shelter. Use a wide range of plants, and incorporate fruiting shrubs and trees to provide food throughout the season, as well as nesting sites and shelter. It’s a good idea to plant mixed hedges, or shelter belts on a larger property, instead of single species hedges, to provide a variety of food sources and nest sites. [pull_quote_center]stock your garden with favourite bird foods to bring wildlife flocking[/pull_quote_center]A corner planted in fruiting shrubs will give an area of cover for birds. Leaf litter should be left – it encourages insects, beetles, spiders, moths, wetas, earthworms, katydids and stick insects – delicacies for silvereye, greywarbler and fantail. Morepork and kingfisher also enjoy insects (as well as mice). Daisies, achillea, monarda, bugbane, alliums, astrantia, sedum and many other flowers draw insects, and provide food for searching birds. Most native plants are yummy for birds, but some are clearly bird-friendly. Corokias are great, their autumn berries provide food, and the tangled shape provides shelter and nesting sites. Wineberry (Aristotelia serrata) and kamahi (Weinmannia racemosa) are also good food sources. Ngaio (Myoporum laetum) is not only a useful shelter plant, but its summer ripened fruit is a favourite with bellbirds and tui. The flowers of kowhai (Sophora tetraptera), flax (Phoromium tenax) and rewarewa (Knightia exclesa) provide a feast for nectar seeking birds, but avoid planting too close to the house as reflections on windows can confuse birds. 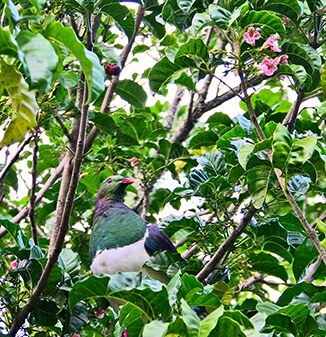 A Department of Conservation report shows a number of kereru are killed every year trying to fly through panes of glass – a distressing way to die for such a beautiful bird. Kakabeak (Clianthus puniceus) has red (also white), beak-shaped, nectar-rich flowers, and was historically cultivated by Maori as fodder for caged tui. If you’re short of space, kakabeak can be standardised, but make sure you allow the plant to flower so birds can benefit. Red hot pokers provide an excellent summer nectar source, and the long-lowering abutilons are a favourite. Birds also flock to bottlebrush, banksia and the Chilean Firebush (Embothrium coccineum). Aloes start flowering in the depths of winter, when bird fodder is scarce – their nectar-rich flowers act like beacons for birds. If you’re serious about encouraging birds to your garden you’ll need to be insect-tolerant – spraying destroys the food supply, and also remember birds have never got used to cats – with good reason. Give your cat a bell – at least give the birds a chance! Even well-fed cats will hunt. Most native birds don’t take food from bird tables or feeders. Hanging out bags of fat and nuts encourages introduced birds, such as blackbirds and sparrows, species that can be aggressive, deterring our indigenous birds. It’s far better to stock your garden with favourite bird foods to bring wildlife flocking. The Cook Strait Kowhai is a great plant for urban Otaki gardens as it naturally occurs in exposed coastal habitats. It is also smaller in stature than most Kowhai and flowers for an extended period throughout winter, making it one of the best natives for attracting Tui into your garden over winter.